DECEMBER 19, 2017: Today, the state’s Group Insurance Commission (GIC) made its first major decision for the FY19 contract year by selecting two pharmacy benefit managers (PBM) to operate the GIC’s pharmacy program. The unanimous decision splits the contract between CVS Caremark and Express Scripts. Rhode Island-based CVS will continue to operate the Silverscript pharmacy program for all of the GIC’s Medicare eligible retirees. For the past decade, CVS has been the pharmacy vendor for all of the GIC’s UniCare plans, including the popular Option Medicare Extension (OME) plan. For the new contract year, which begins July 1, the GIC has decided to consolidate pharmacy benefits for all its Medicare supplement plans under a single vendor – a so-called “carve out” option designed to save money. Similarly, pharmacy benefits for all non-Medicare health insurance plans are also being carved out under a single provider. Saint Louis-based Express Scripts was selected as the PBM for all non-Medicare retirees and active employees enrolled in the GIC. Nationally, Express Scripts and CVS are fierce rivals in the PBM market place. The new contracts include vendor discounts, methods and services designed to achieve considerable savings over the three-year contracts (two one-year extensions are possible, bringing the total contract length to five years). According to the GIC, potential savings under Express Scripts range from $371 million to $513 million. Under the Medicare Silverscript plan, run by CVS, the savings ranges from $135 to $193 million. Members should note that the transition to enroll all Medicare eligible retires under the federal EGWP prescription drug program has already achieved substantial annual savings. 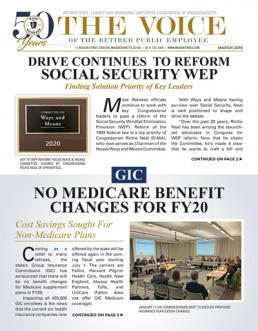 The GIC first initiated EGWP for the OME plan back in 2015, saving over $60 million annually and stabilizing premiums for Medicare enrollees. It has since been extended to cover all Medicare enrollees. Decisions on copayments and deductibles, as well as overall plan design will be made in late January and early February by the 17-member Commission. The next step in the process will be the selection of health plans for the coming year, which should take place at the GIC’s January 4th meeting. In terms of the transition from an existing PBM to Express Scripts (for non-Medicare retirees and active employees), GIC officials have stated that the process will begin soon after the open enrollment period in April and be completed well before the new contract begins on July 1. This includes coordinating prescription renewals and fulfillments to ensure a smooth transition.